Join us at Old Gold after the Ride of Silence or anytime on Wednesday 5/17/17 to raise a glass to the Duncans and to improved traffic safety in the neighborhood. Thanks to our neighborhood bar, The Old Gold, for offering up a portion of their proceeds this Wednesday, May 17 to support the Duncan Family in retrofitting their home for wheelchair accessibility. Our former board member, Brian Duncan, was struck while riding his bike home from Arbor Lodge Park. 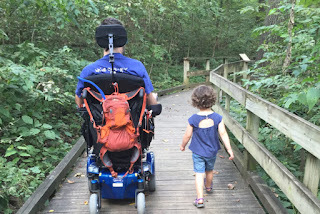 Brian, an avid hiker, cyclist and dedicated father is now wheelchair bound. They've had to sell their two-story home and move in to a one-story home two blocks north. The new house is in need of ($$) modifications for full accessibility. Can't make it Wednesday, but want to help out? Check out Two Blocks North to learn how you can donate to the Duncan Family Fund.